Summer is the season for heading into the great outdoors in search of adventure on family camping trips. While your kids are likely excited to sleep under the stars, there are various safety precautions you should go over with them before you depart – especially regarding proper campfire etiquette. 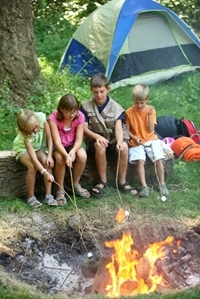 Here are some vital fire safety tips for your family camping trip. You should make sure to consider the surrounding terrain when picking a spot for your campfire site. Ideally, you should not build a fire under low, overhanging trees or near dry grass, shrubs or piles of leaves. If you're camping at a state park or organized campsite, beware of power lines and check local rules about unauthorized campfire locations. Even if you're clear of tree branches and dry grass, your family should know that the campfire site should be dug into the ground and surrounded with large stones. This design will help prevent the flames and heat from jumping out of the pit and endangering your children, pets, supplies or nearby flammable materials. Kids should know never to go too close to the flames to avoid an accident. Additionally, you should have a fire extinguisher, buckets of water or mounds of sand to throw on top of the flames in case they get out of control. When putting out the fire for the night, make sure to allow it to burn down completely before heading to bed. All of the coals and wood should be completely smothered with earth or water to cool down the area.